The shale-gas revolution in the United States has led to massive increases in natural gas production, increasing our domestic supply and reducing prices. While global trade in natural gas exists, the infrastructure and volume is low enough such that there isn’t much of a single global price for natural gas (unlike oil, where there are a few prices which tend to stick close to one another). You can look at spot prices for various countries here, note the large disparity. The shale gas revolution in the U.S. has been so enormous that infrastructure that was built with the expectation of importing natural gas is now being switched to export natural gas to other countries. 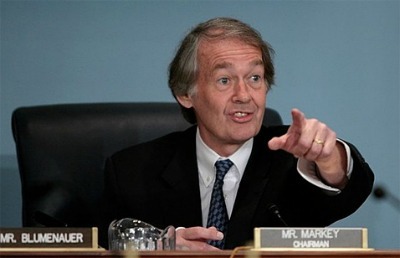 Congressman Ed Markey (D-Mass.) is apparently concerned that producers of natural gas in the U.S. would like to export some of the excess to take advantage of higher prices in other parts of the world. Yet as Markey so often likes to point out, America has in recent decades consumed more oil than we produced. If other countries had decided 40 years ago to shut off their oil exports to keep domestic prices as low as possible, America would be a much different place today (and much worse off).